Expert surgeons in the UK say patients should no longer be given all-metal hip replacements, despite assurances from regulators amid safety concerns. 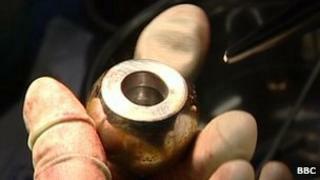 Large head metal-on-metal implants can cause serious side effects with wear. The BBC's Newsnight and the British Medical Journal recently discovered the problems were known about for decades. The Medicines and Healthcare products Regulatory Agency (MHRA) insists the implants can still be used but the British Hip Society disagrees. Its surgeons say the operations should no longer be performed. But patients with joints measuring less than 36mm (1.4in) and those who have had only hip resurfacing are not affected. The MHRA said last week that patients who have already undergone large head metal-on-metal hip replacements - 49,000 patients in all - should be monitored annually for life. The regulator said that they should have blood tests to check for minute metal debris from the joints, and magnetic resonance imaging scans if they have raised metal levels or show adverse symptoms. According to latest figures from the National Joint Registry for England and Wales, about 1,400 patients had a large head metal-on-metal hip replacement in 2010. The British Hip Society says patients like these should not receive such implants because there is not enough evidence to show any benefits outweigh the risks. But Dr Susanne Ludgate, clinical director of the MHRA, said the implants were justified in some instances. "We recognise that there is emerging evidence of increased revision rates associated with large head metal-on-metal hip replacements. But the clinical evidence is mixed and this does not support their removal from the market. Metal-on-metal resurfacing hip implants enable young patients to lead pain-free, independent lives. "The percentage of patients implanted with these large head metal-on-metal hip implants dropped to 2% in 2010 and is continuing to decrease. "There are alternative hip replacements available that are proven to produce good clinical outcomes for patients. "The MHRA, in combination with our expert advisory group, is continuing to monitor closely all the latest evidence about these devices. We will take quick action if we need to and, if patients have any questions, they should speak to their orthopaedic surgeon or doctor."